There was plenty of small scale activity heading towards the suns western limb today, with 2 active regions and a filament. 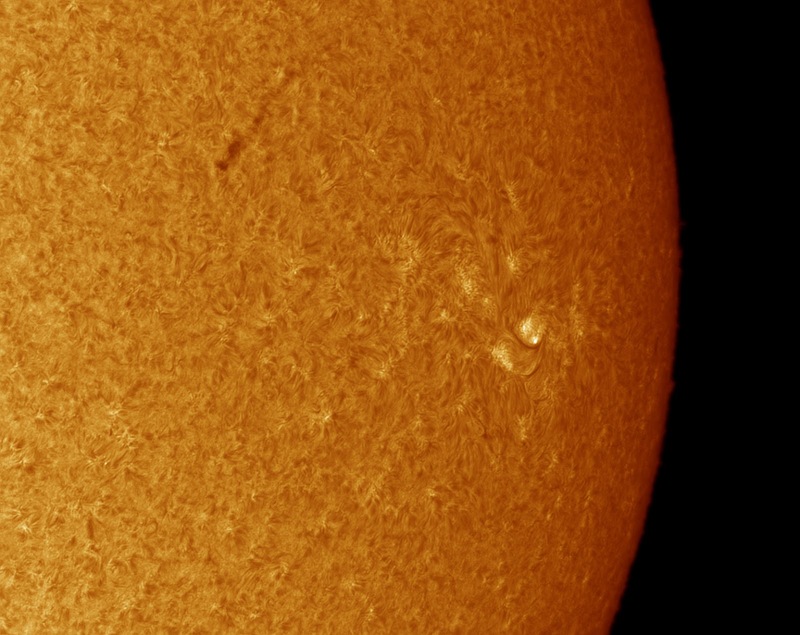 Taken with the ED60 scope using a Lunt 50 etalon double stacked with a Daystar Quark and FLIR GH3 ICX814 camera showed up these details nicely. 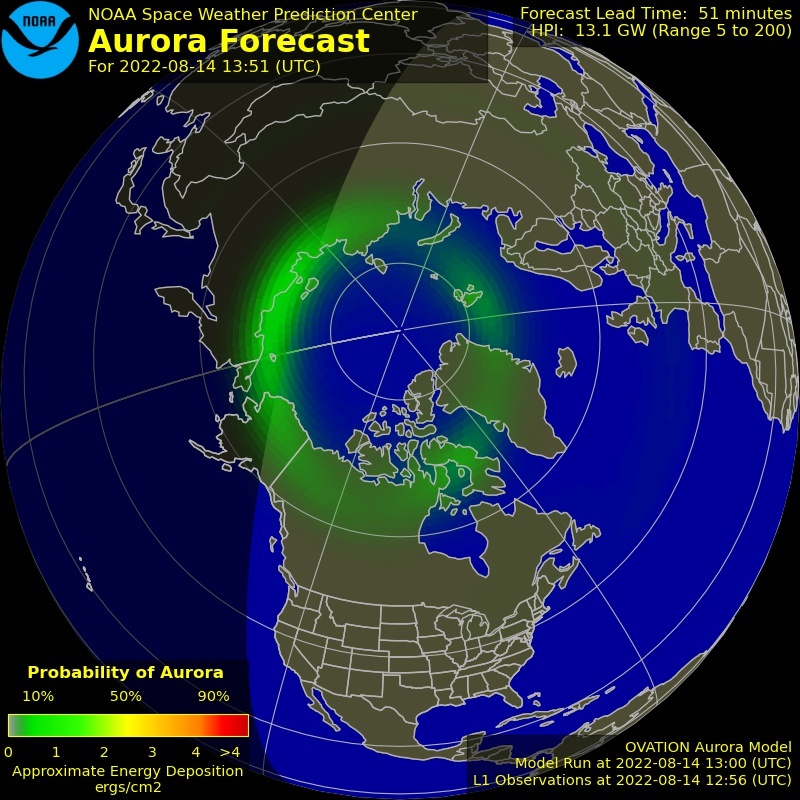 Sadly this activity will be gone again over the next couple of days and with nothing new coming around the opposite limb looks like we could be back to a blank sun again. Hopefully something that won't last too long! 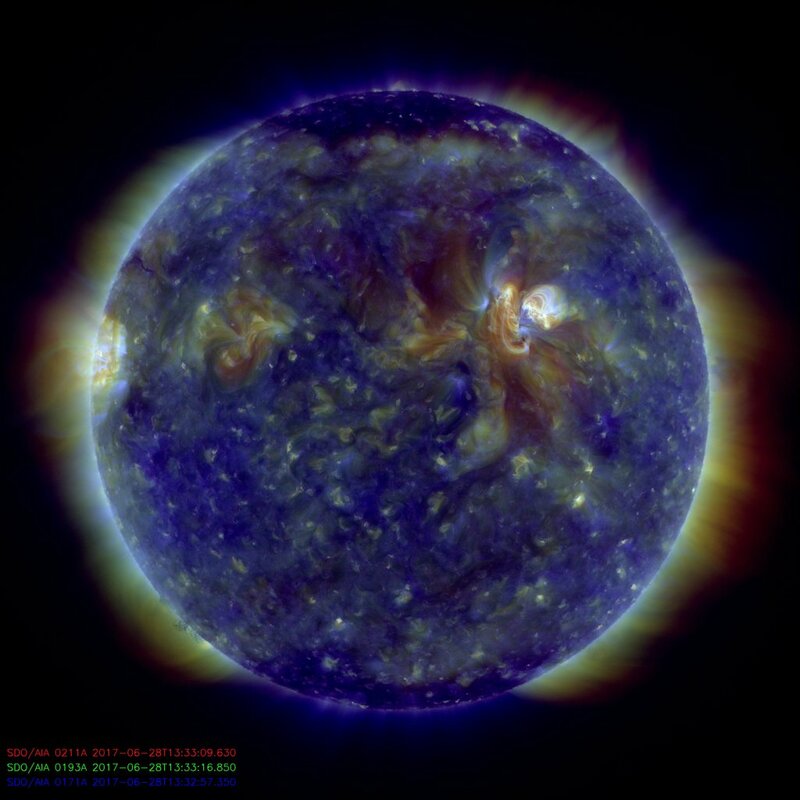 The ED60 I used to take this image is loaded with spherical aberration at 393nm compared to some of my other scopes that gives a softness to the image that is not really possible to focus or sharpen away. Today I stopped it down to 40mm in an attempt to improve matters, and while this improved things it is still not a good performer as my 40mm f10, which, I think will become part of the travelling setup. There was plenty of haze today, which in CaK wavelengths has the effect of increasing exposure time. This image was taken with the 2x cemax barlow and the FLIR GH3 ICX814 camera along with the home brew CaK filter. 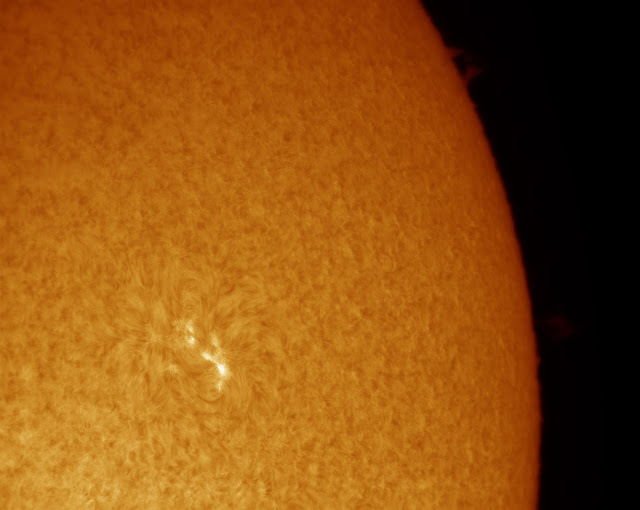 The sun was looking nice today - there was a nice flame prom on the eastern limb, but all the action was towards the western limb, with large active region AR12738 getting very close to passing over, but small possibly developing active region AR12739 despite being small was very bright. 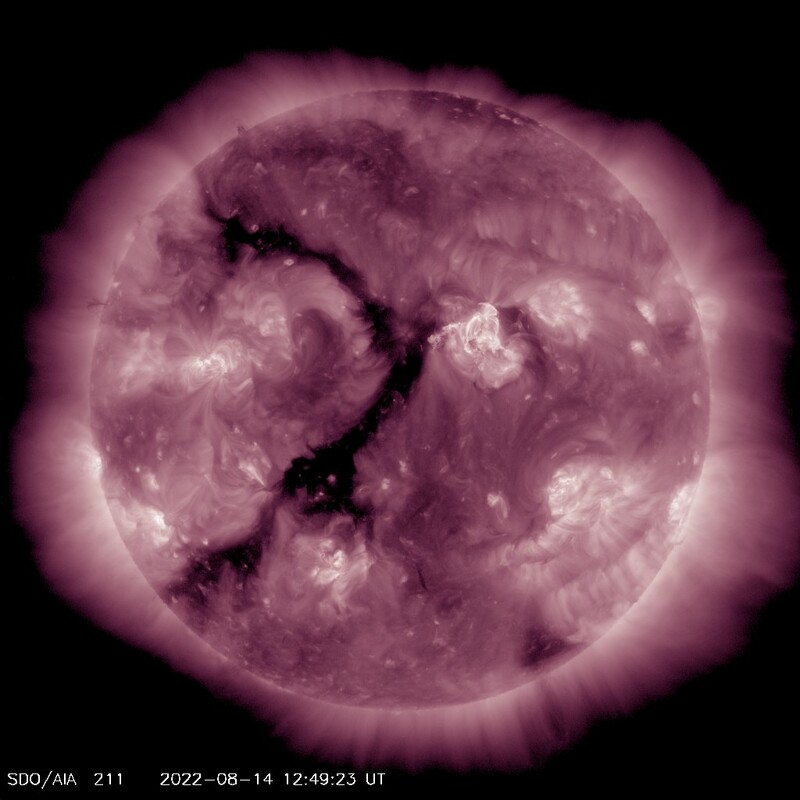 It and a small filament mark the boundary of a coronal hole. 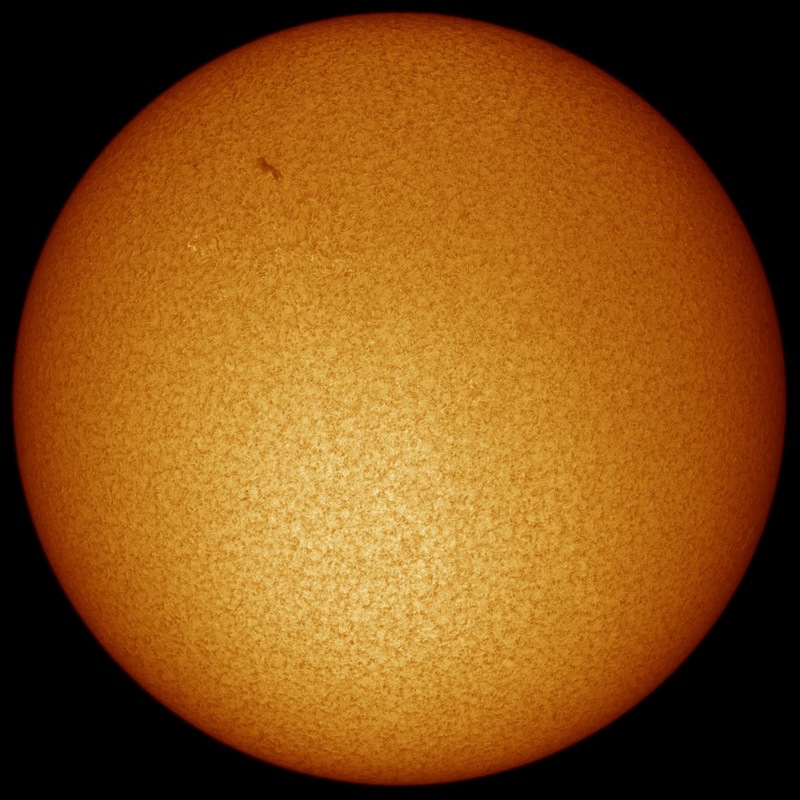 This image was taken with the LS50 etalon on the ED60 scope double stacked with the Daystar Quark. 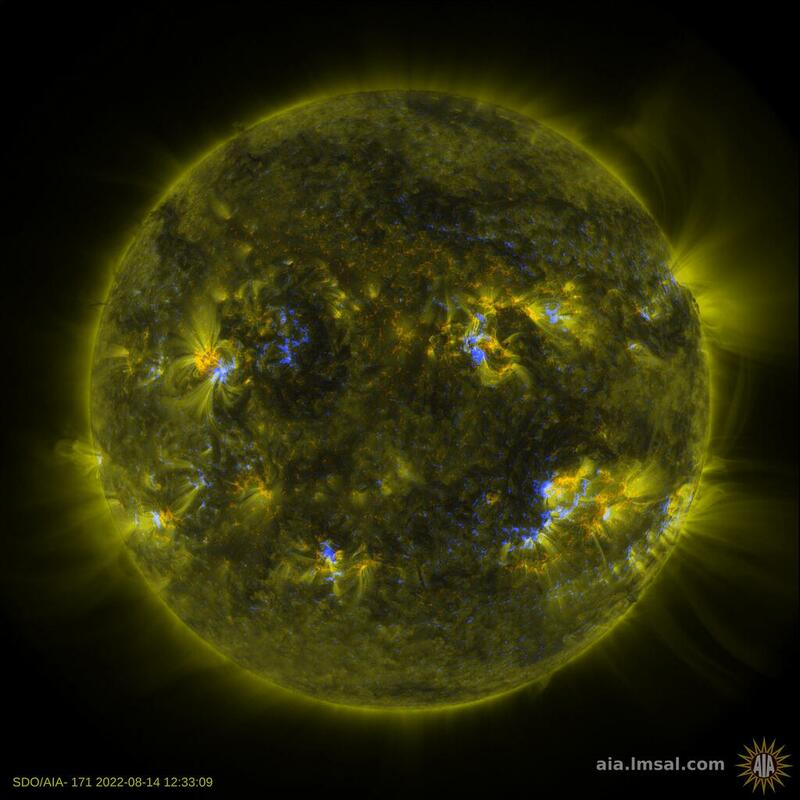 It is a mosaic comprising of four panels and was taken with the FLIR GH3 ICX814 camera. 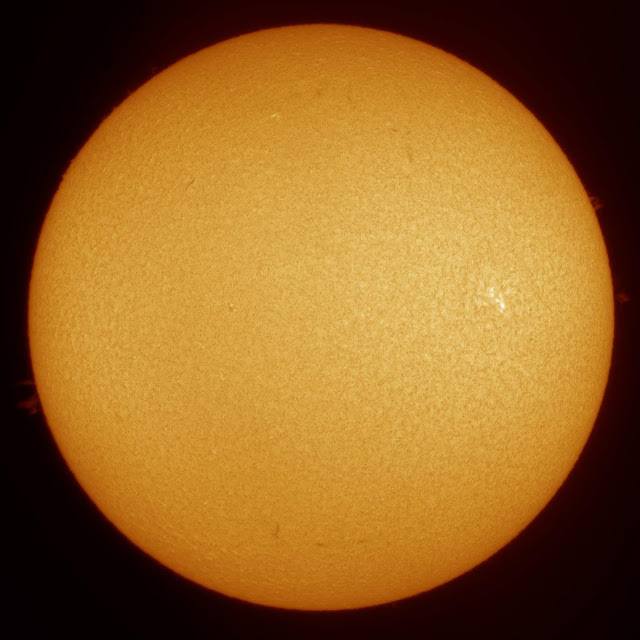 My favourite double stack views at the moment are with my Lunt 50 etalon double stacked with a daystar Quark on the back of my Ed60 refractor, this gives a full disk view with a 32mm plossl eyepiece and maintains a good even field of field of view rich in contrast. I get a quarter disk when imaging with the FLIR GH3 ICX814 camera. 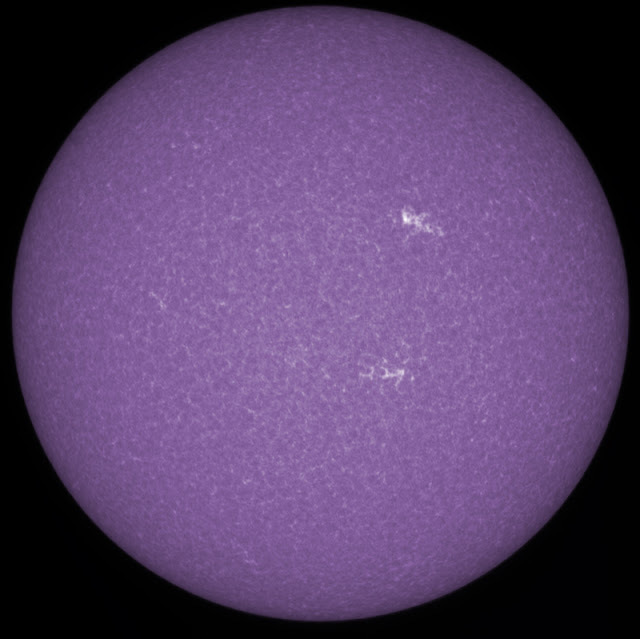 If the clouds disappear for long enough it would be good to make a full disk mosaic using this setup. 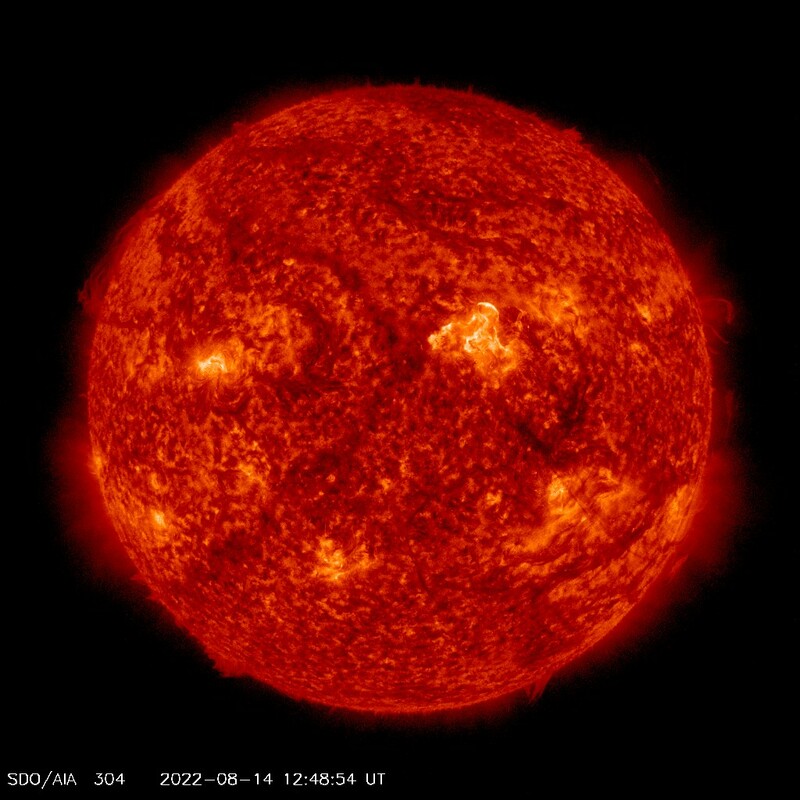 The sun always looks nice when there's a large active region complete with spots and plage and todays sun fitted the bill. 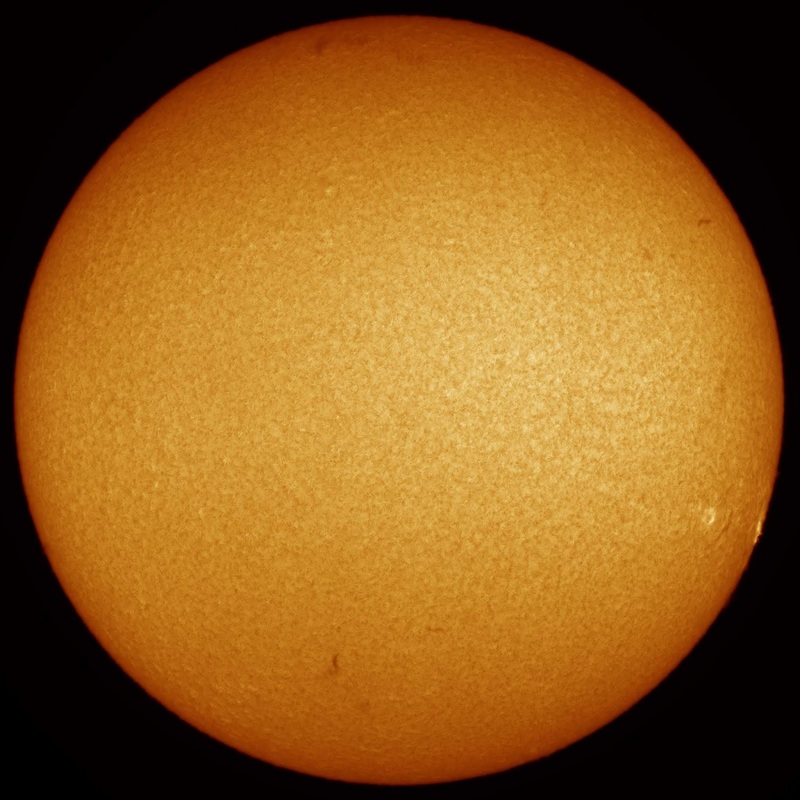 Taken with the ED60 at f12 this scope has noticeable more spherical aberration at 393nm than my other refractors, but with the Skywatcher AZ Gti mount makes for a very nice grab and go setup. The sun was shining nicely in North Wales this morning, but being in the mountains makes for choppy seeing. I was trying out the portable rig - my Skywatcher AZ Gti mount, with the ED60 with a pair of double stacked Lunt 50 etalons on. It was difficult getting focus as i'd forgotten the sun shade for the laptop and the bright spring sunshine was blinding. However it was nice to be able to image AR12738 as it was squarely geo effective, maybe this will be the last big sunspot of cycle 24? 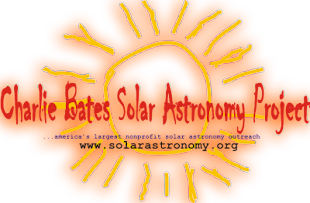 Visually saturdays prominences were great at the eyepiece on the Coronado SM90! I got the opportunity on Saturday to test out a setup that i'd been wanting to use for a while with the FLIR GH3 ICX814 camera and the large chip it has. Using the 100mm Tal at 1000mm focal length allows me to still get the full disk on a single frame. 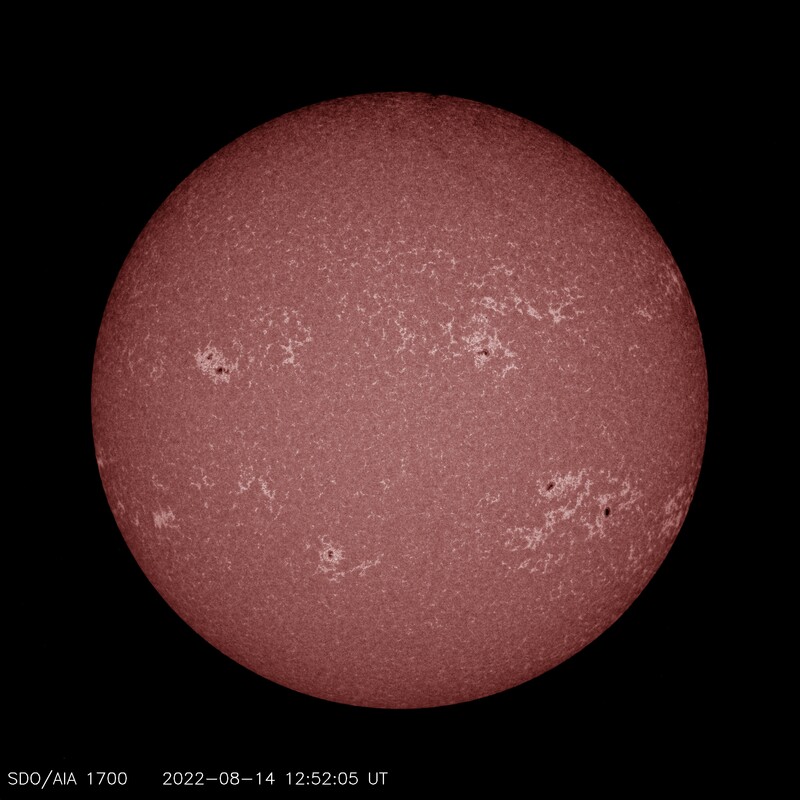 The increased resolution of the 100mm means when the image is viewed full size both the spicule ring and also prominences are visible. There is a ghost image floating around in the bottom half of the frame that needs to be dealt with, but, on the whole i'm very pleased with this image. 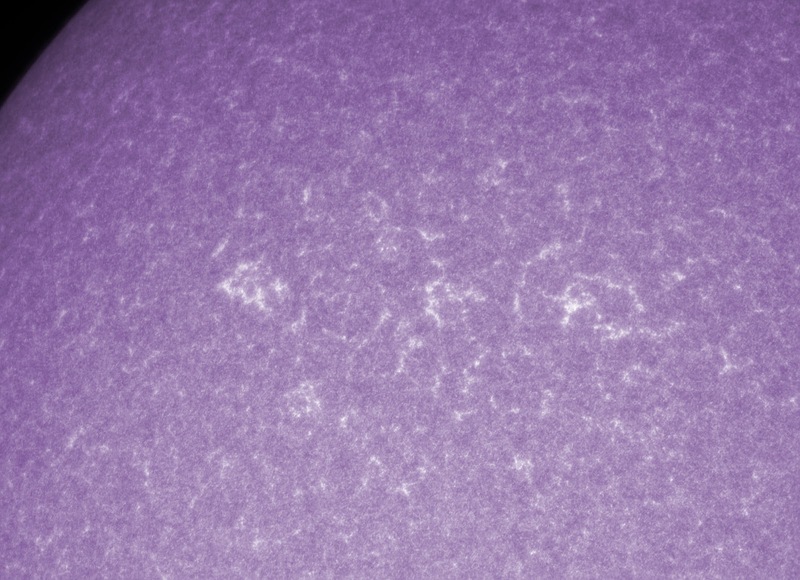 I decided to try a shot of the departing active region in Sodium light. There was nothing to see apart from maybe 2 tiny pores. 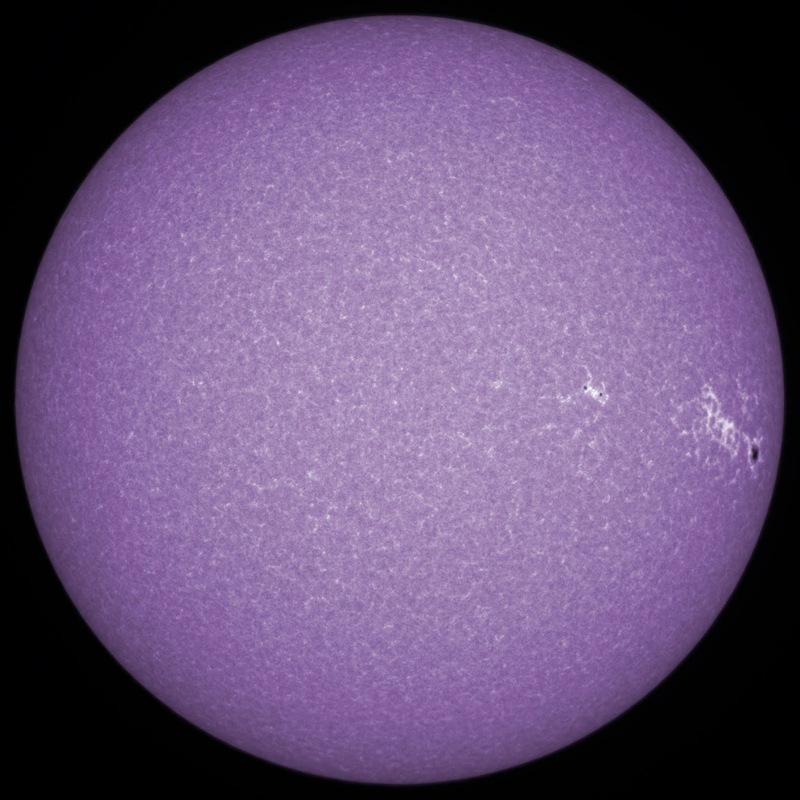 Taken with the 100mm Tal refractor and Sodium Quark along with the FLIR GH3 ICX 814 camera. 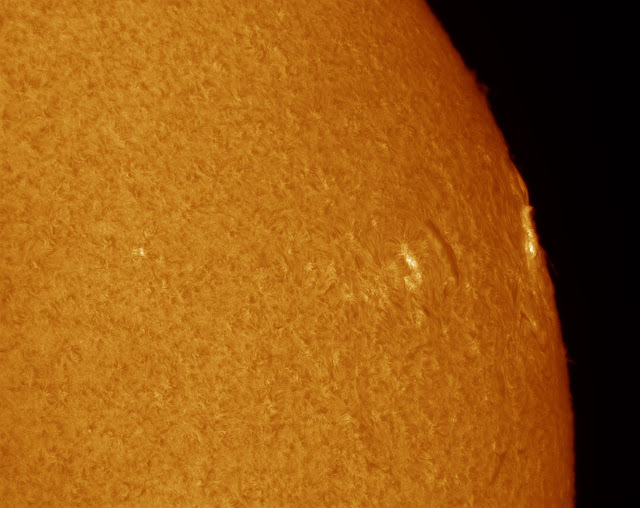 Prominences were the order of the day on Saturday; decaying AR12737 was approaching the limb, and apart from very small polar filaments the disk was essentially blank. 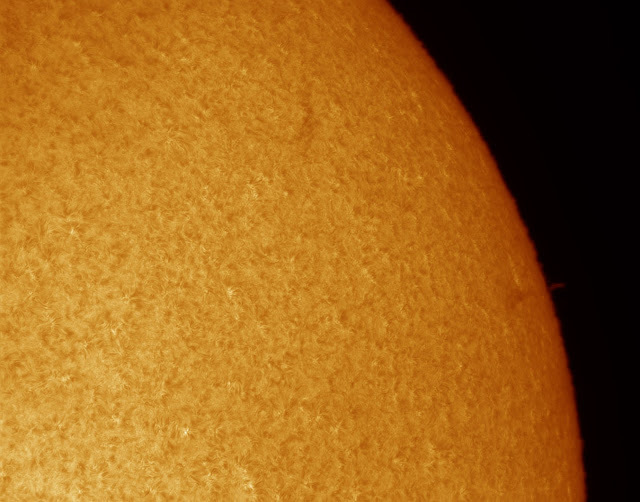 All the action was on the limb though, with a number of prominences that visually were very impressive. 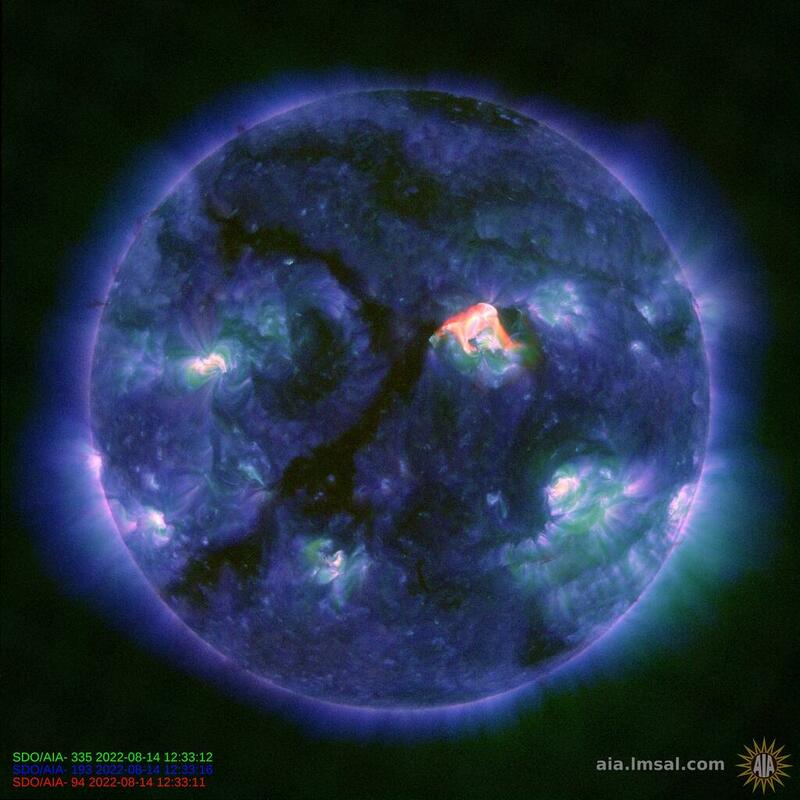 Taken with a Lunt50 etalon on the Coronado SM90 and the FLIR GH3 ICX814 camera. 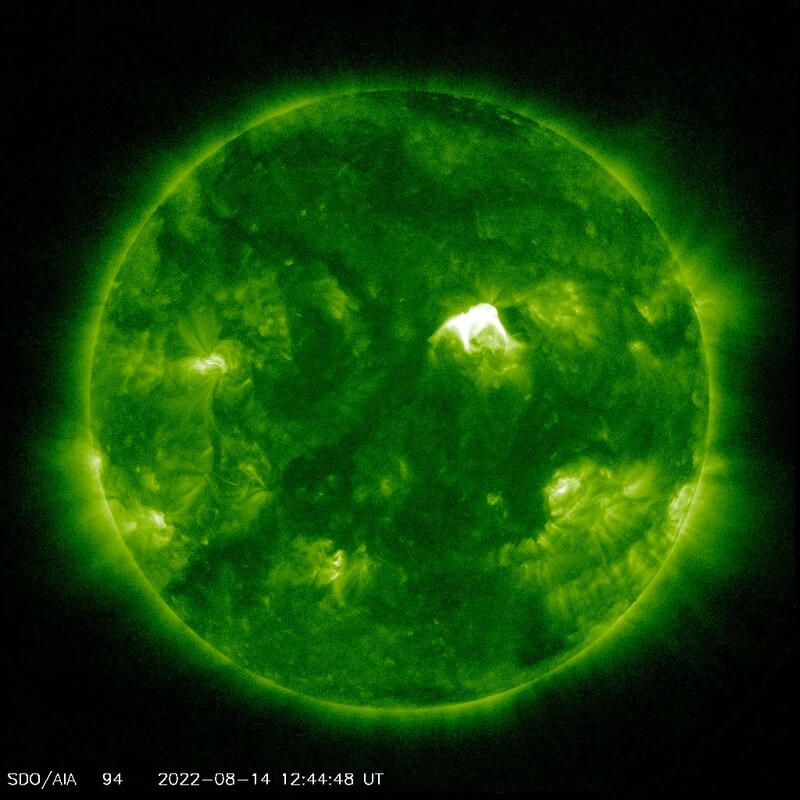 In a week this little active region started as an emerging flux region, developed into an active region with a number of small spots, and by now was decaying. 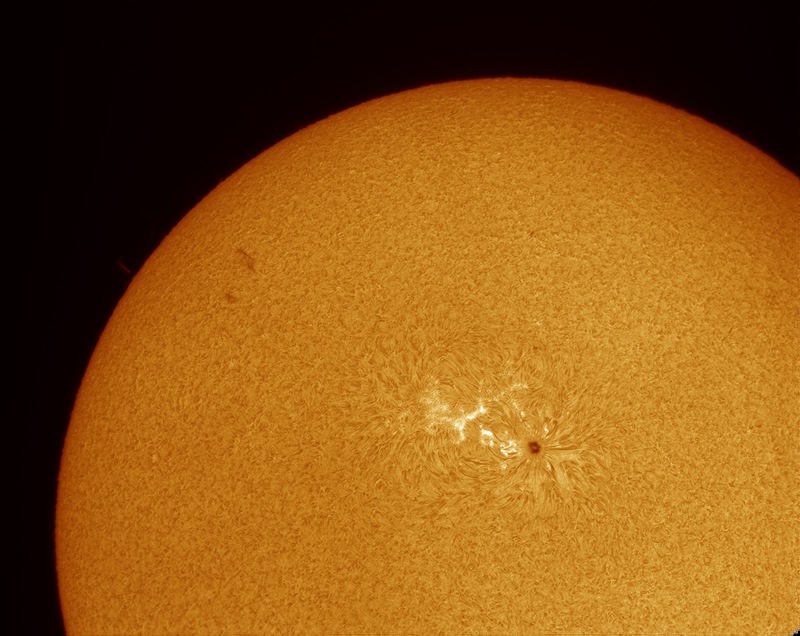 This shot was taken as it approached the eastern limb with the SM90 double stacked with a daystar Quark. Seeing was far from ideal, and this image was by far the best of a number that was taken. When I got up this morning the sun was blank, typical of solar minimum. 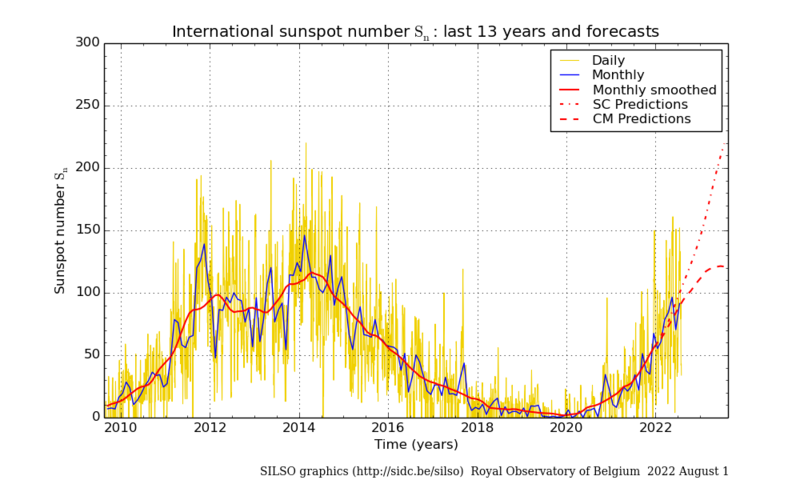 However throughout the day an emerging flux region has rapidly developed into a crackling bipolar active region with 2 rapidly growing sunspots. It will be interesting to see how this develops more in the days ahead. Taken in the near ultraviolet in calcium wavelengths (393nm) with the 40mm f10 scope, 2x Cemax barlow, homebrew CaK filter and the FLIR GH3 ICX814 camera. Sundays session also gave me a transit of this turbo prop going from Manchester to Jersey. There are only 3 frames where it is in shot so not much point of an animation. 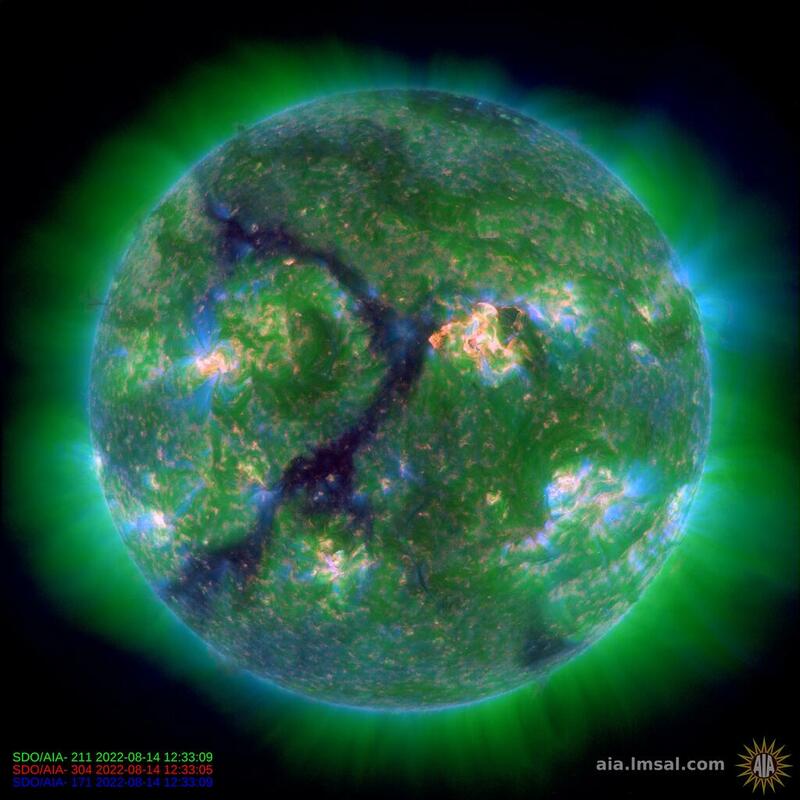 The seeing was awful too in the shorter wavelengths, but was nice to catch the surge prom from the active region in this image. Jetting off to the sun! Flight LS271 Leeds Bradford to Alicante put on a nice transit for me this morning whilst I observed the sun with the Coronado SM90 double stacked with a Daystar Quark. Wish I was flying off to warmer climes like the people in this plane. First trial today of double stacking the SM90 with my flat 50mm Lunt etalon. 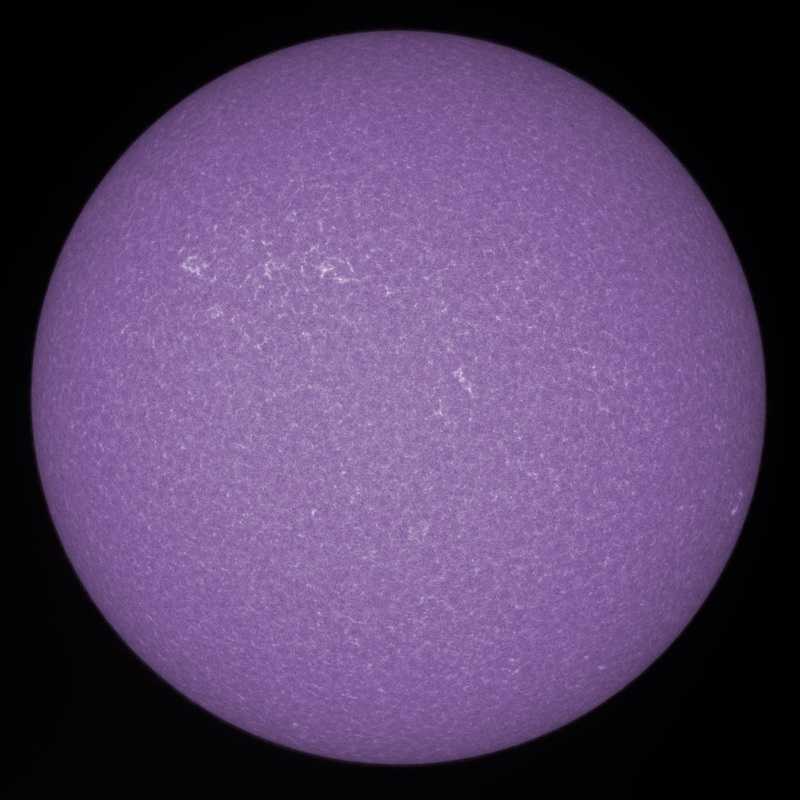 It works well even if there is little to see on the Sun at the moment! Using the Coronado SM90 double stacked with a Daystar Quark to enhance the contrast I zeroed in on the active regions that are passing over the limb. 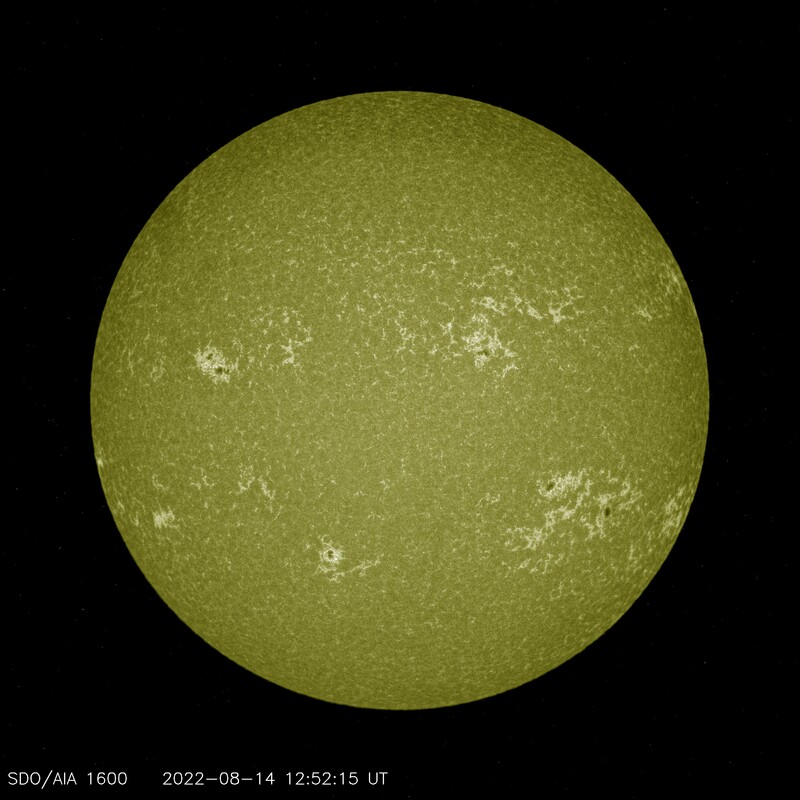 These really have become quite active for solar minimum over the past couple of days, so it was nice to get a view of them before they departed properly. Less than ideal conditions mean that the disk isn't as sharp as I know it can be, but it has still came out ok. Taken with the 60mm scope at f15 with the homebrew CaK filter and the PGR GH3 ICX814 camera. 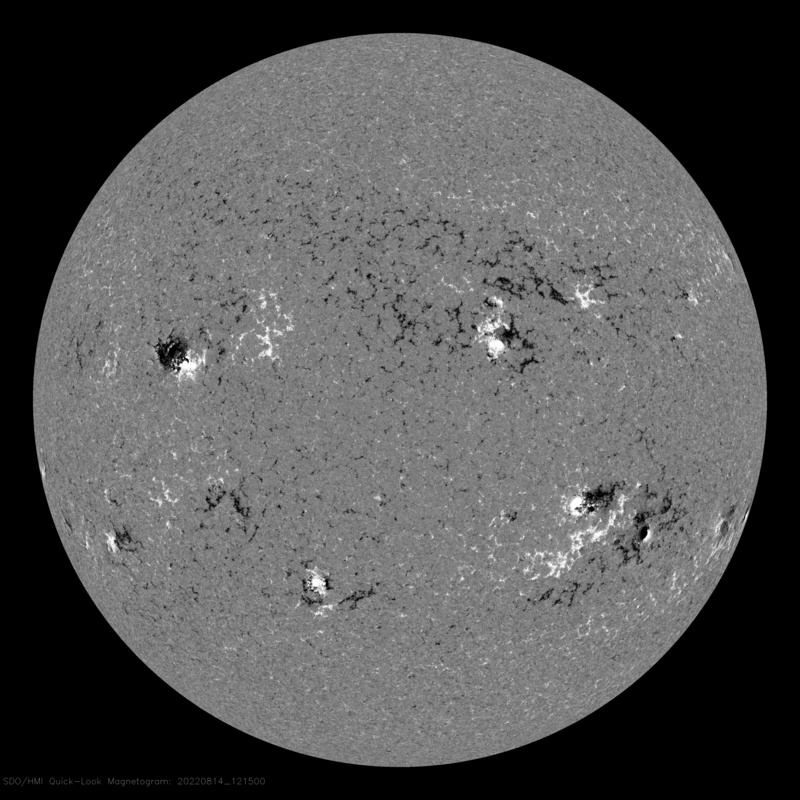 There was the smallest of proms on the solar limb on Sunday, with a wispy filaprom associated the smallest of decayed active regions. This is the bounty that solar minimum delivers! Taken with the SM90 double stacked with a Daystar Quark with the FLIR GH3 ICX814 camera. Zooming in on the region of decaying plage using the 100mm scope somewhere up around 2000mm focal length with the homebrew CaK filter and FLIR CH3 camera. The Airylab SSM was used to only harvest the best frames with the unstable polar maritime airmass that was over the UK this Sunday. 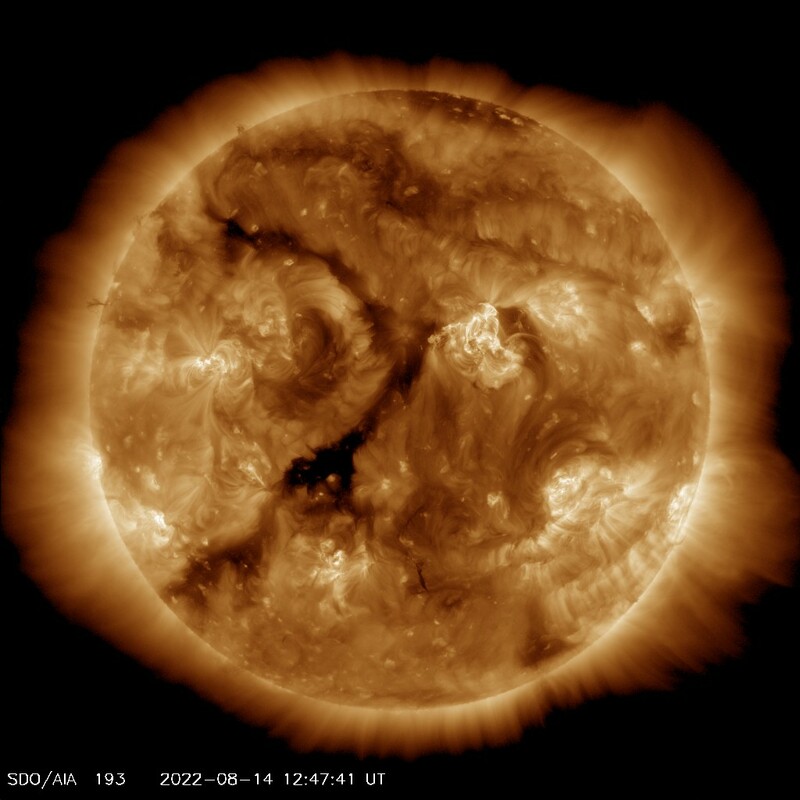 Viewing the sun in Calcium wavelengths showed a number of areas of plage around the solar equator that mark where active regions from previous rotations. 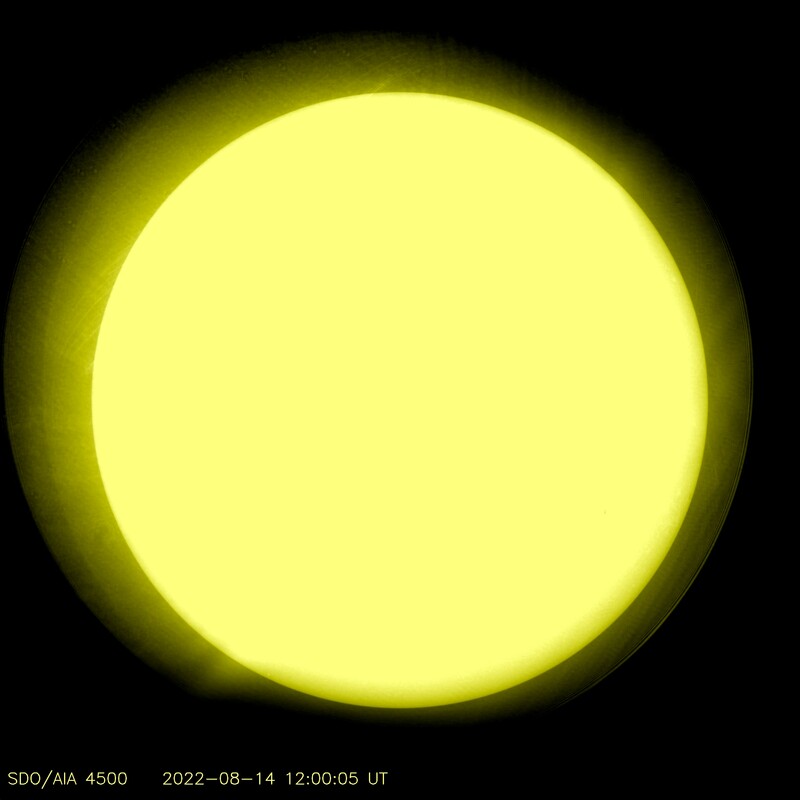 These are the remnants of activity from solar cycle 24. 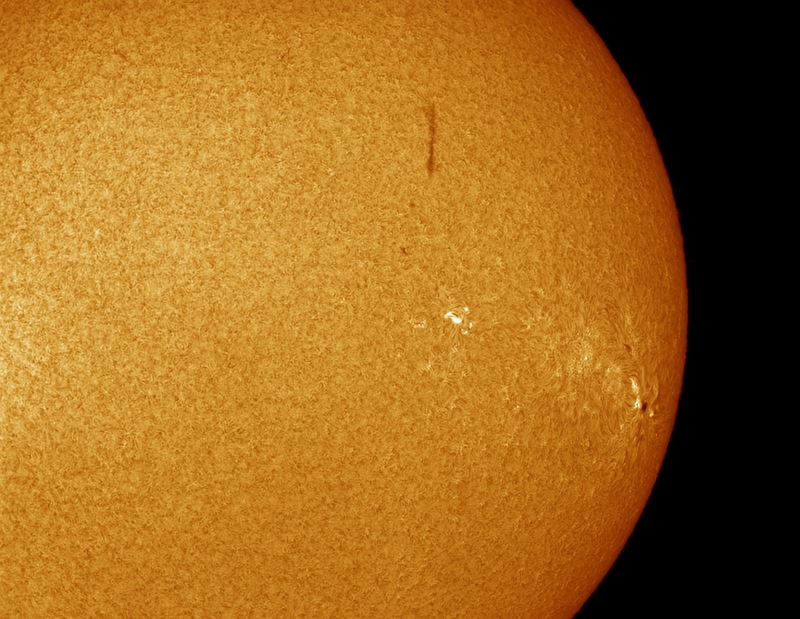 Taken with a 60mm scope at f15 with the homebrew CaK filter and a FLIR GH3 ICX814. 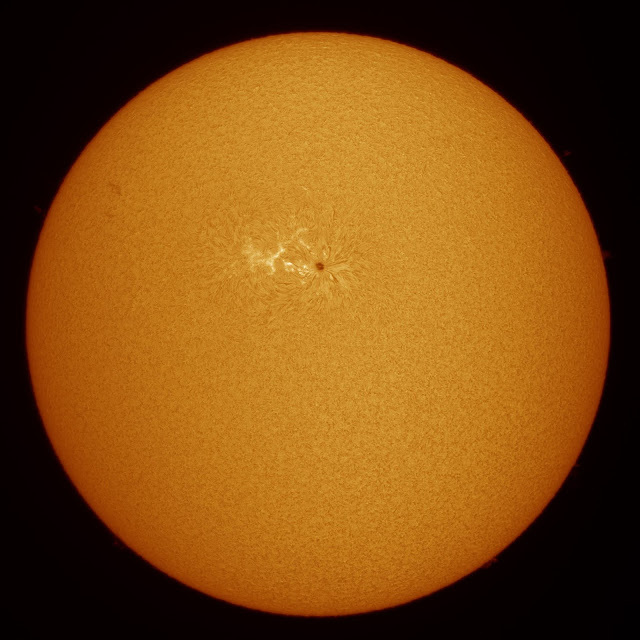 Double stacking the Coronado SM90 with a Daystar Quark works well to really narrow the bandwidth and bring out the contrast in hydrogen alpha images. 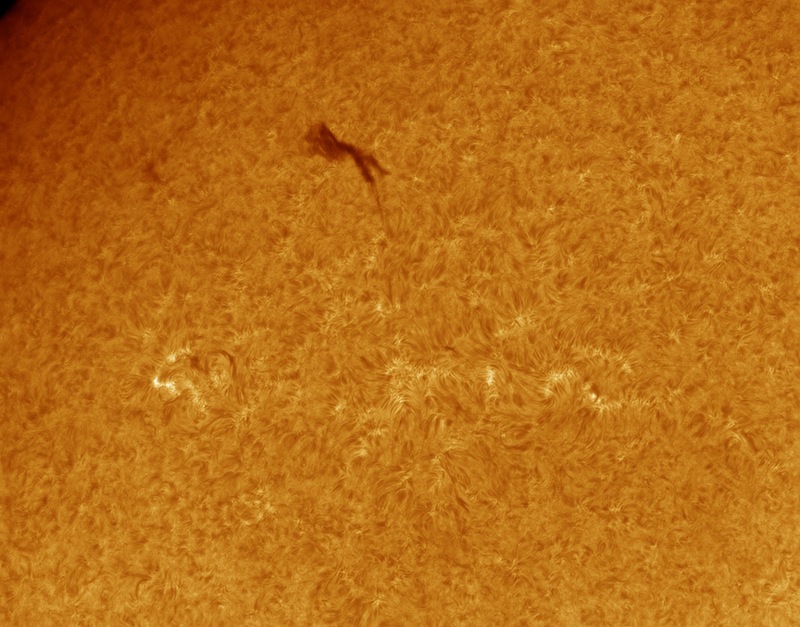 This has the effect of making the filament much darker but also bringing out the brighter plage from the remains of a previous active region. Taken with the FLIR GH3 ICX814 camera. The sun is quiet at the moment, a small filament when looking closer reveals a region of plage that shows relic active regions from previous rotations. 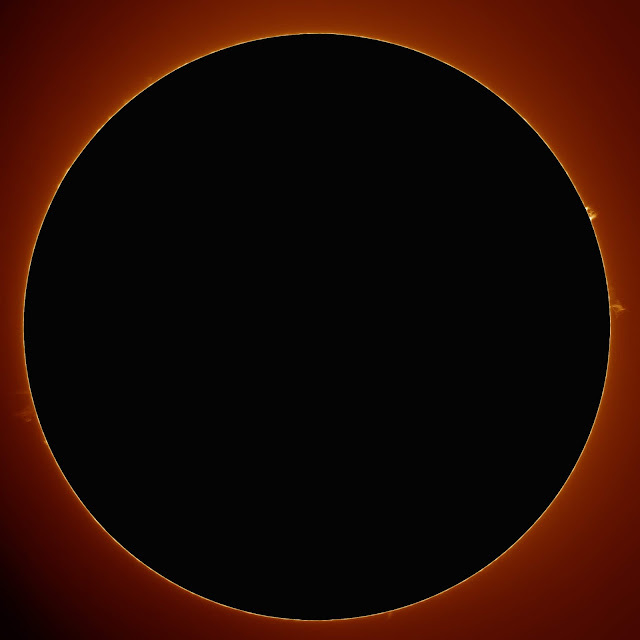 Apart from that very little is going on, even the prominences are small. Taken with the Coronado SM90 with a FLIR GH3 ICX814 camera. 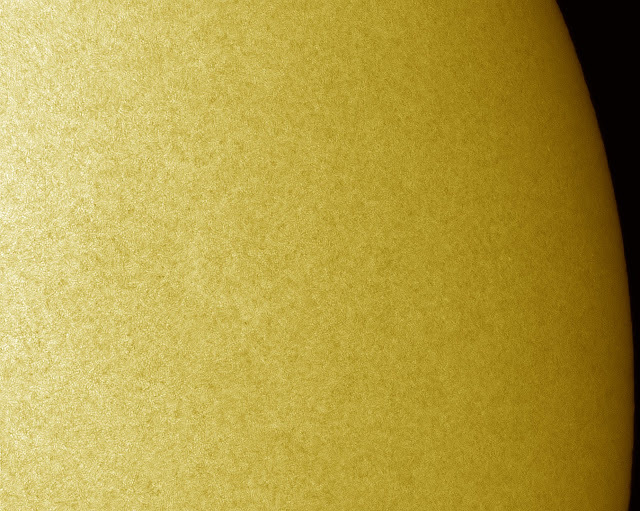 A quick CaK full disk in between the passing clouds, seeing was awful and very difficult to find focus. Still nice to see the active regions we currently have, even if the image is soft. Taken with the 40mm f10 and 2x cemax barlow, grasshopper ICX814 camera. Hoping for some better images tomorrow! 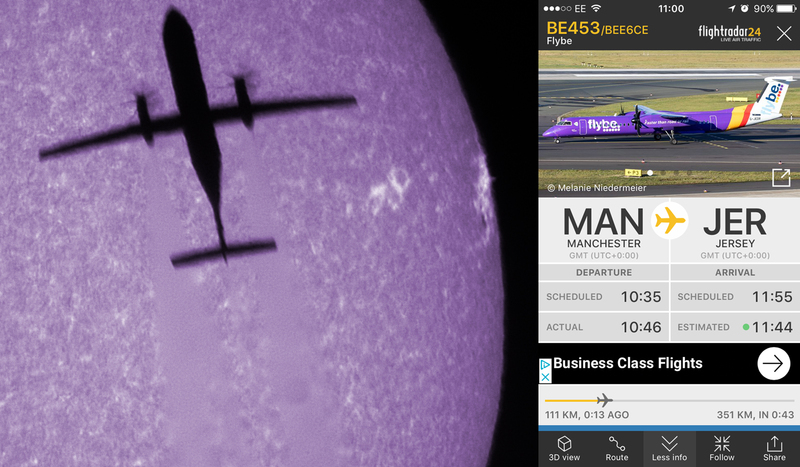 Happy whilst observing on Sunday morning to see the silhouette of a plane pass in front of the sun. I quickly checked flight radar and was surprised to see it was Icelandair flight FI450. 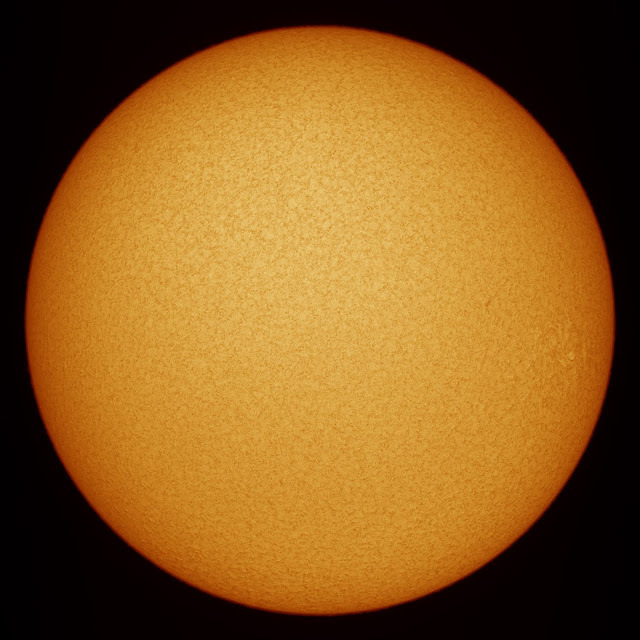 Taken with the SM90 double stacked with the Daystar Quark and PGR Grasshopper 3 ICX814 camera using 2x2 binning. Using the same setup as in the previous image the sky was blue for long enough to try a bit of a timelapse, only 8 minutes here but it shows the sun doesn't stay the same for long! 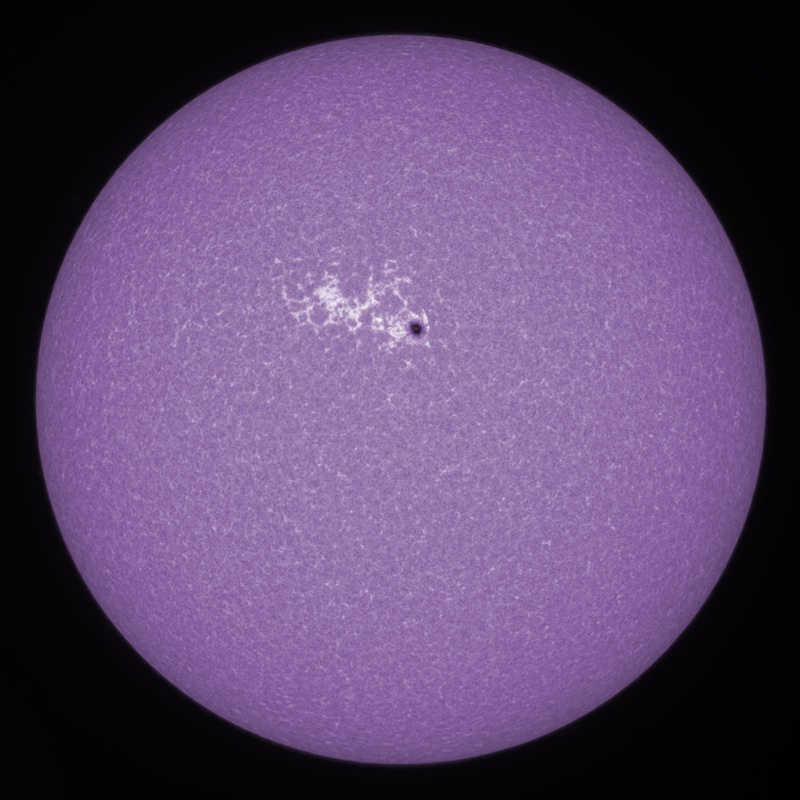 One of the ways to get more detail and contrast when imaging the sun is to use a double stacked filter, Thows the region of plage on the limb. Coronado SM90, Daystar Quark and the PGR Grasshoppr 3. 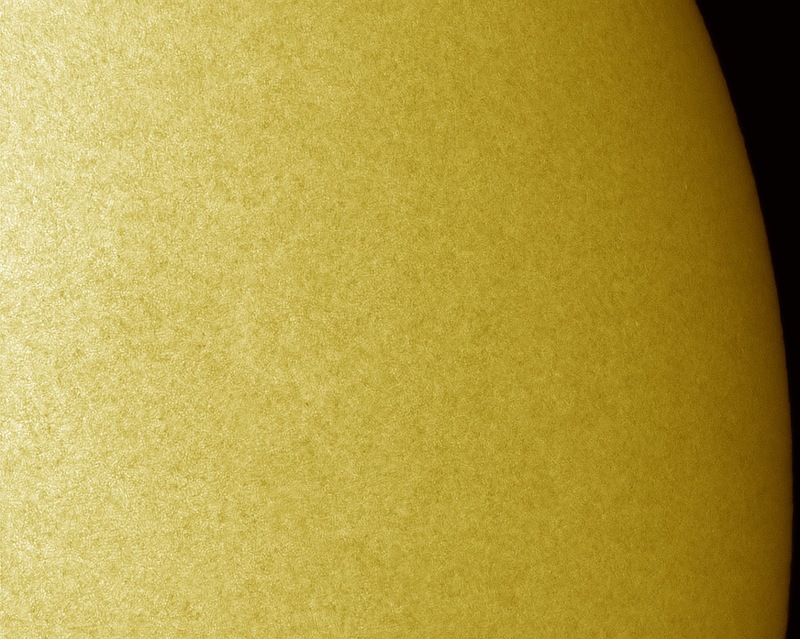 Very little to see on the full disk in Ha this weekend, just a small region of quiet plage departing the limb. Not even any proms to speak of! Taken with the Coronado SM90 with the PGR Grasshopper 3 ICX814 camera. 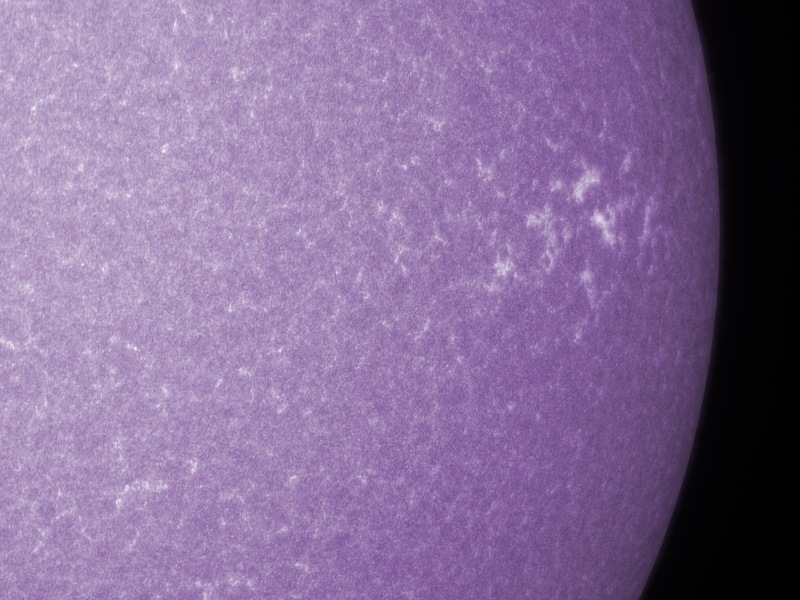 The better seeing on sunday meant this CaK disk turned out the way I was hoping for! Be sure to double click the image, it's a big one! Taken with the skywatcher ED80 stopped down to 60mm, the PGR Grasshopper 3 ICX814 camera, and the homebrew CaK filter. 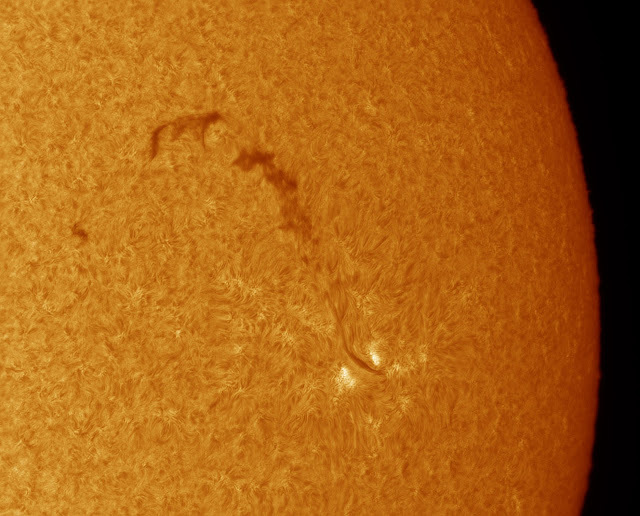 The seeing was having it's better moments on Sunday, so decided to get a closeup on the region of departing plage using the 100mm refractor at f20+, using the PGR Chameleon running in 12bit mode. Quite surprised at how clean the image came out. Taken with the homebrew CaK filter. Another view of the snaking filament as it approaches the solar limb. 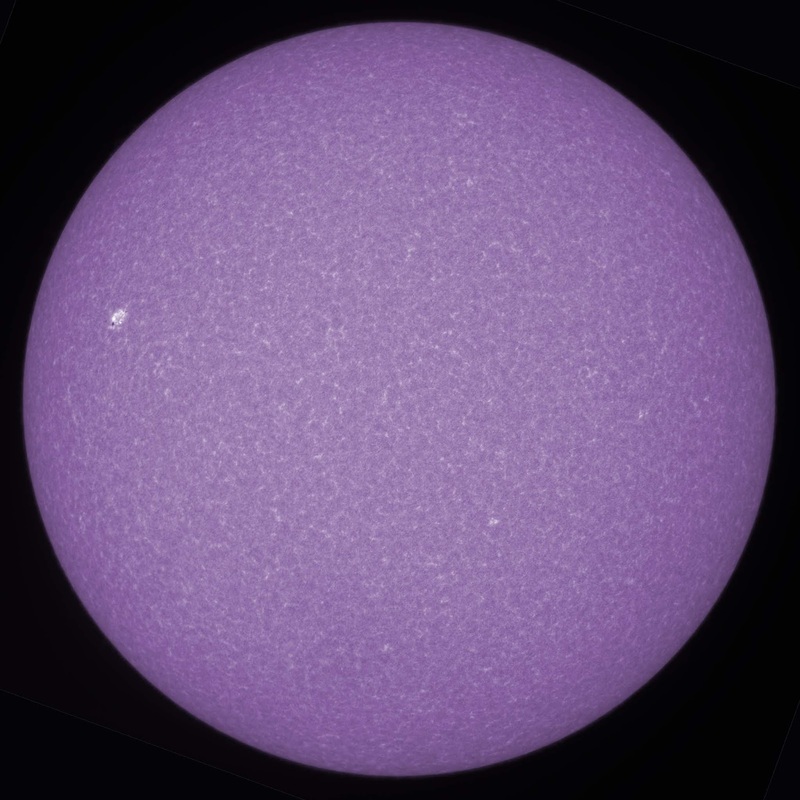 Taken with the SM90 and a Daystar Quark for double stacking. Brierley Hill Solar. Powered by Blogger.